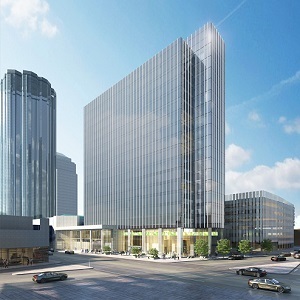 Faced with stiff competition for tenants from ICE District and other new office developments in downtown Edmonton, the Alberta Investment Management Corporation (AIMCo) says it will completely redevelop its HSBC Bank Place tower in the downtown business sector. The renovations will upgrade HSBC Bank Place from a class-A office building to class-AA. AIMCo says. Preliminary work got underway in June, with completion set for late 2019. AIMCo bought HSBC Place along with another downtown tower, Enbridge Place, in February 2017 from former owner Dream Office REIT (D-UN-T), when it divested itself of four major properties in the Alberta capital. Reports at the time indicated HSBC Place was sold for $35 million as the city’s economy continued to slump in the face of a downturn in the oil and resource sector. AIMCo has yet to announce its plans for Enbridge Place, though it has said it would also be slated for redevelopment. – and a revitalized two-storey lobby. AIMCo is targeting LEED Gold Certification and WELL Gold Certification, and to become the first office building in Western Canada to be Wired Certified. It has not announced how much the renovations will cost. “A full redevelopment of this scale requires the expertise of many partners, and AIMCo is fortunate to utilize local and national expertise to see it through,” said Micheal Dal Bello, senior vice-president, real estate at AIMCo, in a release. – CBRE Group – leasing broker. AIMCo feels the time is right for such a redevelopment due to an improving employment landscape and recovering economy in the city. In Q2 2018, the Edmonton market saw more than 261,000 square feet of positive net absorption, the best quarter for tenant activity in more than 20 years, leading to a 300-basis point year-over-year decline in vacancy to 16.9 per cent. “Tenants in the Edmonton office market have a growing appetite for quality office product, as evident by the successful lease-up of recent new-build trophy spaces,” said David Young, executive vice-president and managing director of CBRE Edmonton. “Tenants across all industry sectors are beginning to leverage real estate to attract and retain the best talent. The ambitious 25-acre, mixed-use ICE District development led by Katz Group has sparked a major reshuffling of tenants in Edmonton. The Edmonton Tower (completed, and recently sold to AIMCo) and Stantec Tower (to be completed in 2019), contain more than 1.2 million square feet of space. They are more than 90 per cent leased. The nearby Epcor Tower has also continued leasing up, recently adding tech gaming tenant Bioware with a 75,000-square-foot lease. Like many others moving into the new buildings, BioWare is vacating an older property. Owners of B and C office space have been forced to rethink the future for their buildings. Several have been pulled out of the office market to be redeveloped for other purposes, others have been upgraded. Owner Strategic Group, for example, has continually invested in Edmonton’s oldest office skyscraper, the CN Tower, to retain its existing tenants and attract new ones. AIMCo is one of Canada’s largest and most diversified institutional investment managers with more than $103 billion worth of assets under management, as of Dec. 31. It operates at arm’s length from the Government of Alberta and invests globally on behalf of 32 pension, endowment and government funds in Alberta. AIMCo’s $13.6-billion real estate portfolio includes long-term, direct investments in office, retail, industrial and multi-unit residential properties located in Canada’s major cities, as well as non-Canadian markets. Epic Investment Services is an employee-owned real estate advisory, asset and property management and mortgage services company. Operating from offices in Toronto, Montreal, Ottawa, Calgary, Edmonton and Vancouver, Epic has more than $14 billion in assets under management. Its national portfolio includes office, retail, industrial and multi-family properties and it comprises more than 24 million square feet of leasable commercial space. Cushman & Wakefield is among the world’s largest real estate services firms with 48,000 employees in approximately 400 offices and 70 countries. In 2017, the firm had revenue of $6.9 billion across core services of property, facilities and project management, leasing, capital markets, advisory and other services. DIALOG’s multidisciplinary team includes architects, urban planners, interior designers, structural, mechanical and electrical engineers, and landscape architects. It practises across Canada and the U.S. from studios in San Francisco, Vancouver, Calgary, Edmonton and Toronto. PCL is a leading Edmonton-based construction company conducting business throughout North America, Australia, and the Caribbean. The employee-owned PCL family of companies is the largest contracting organization in Canada and one of the largest in North America. PCL operates in 31 major centres with an annual construction volume of more than $8 billion and is involved in more than 700 projects at any given time. CBRE Group, Inc., a Fortune 500 and S&P 500 company headquartered in Los Angeles, is the world’s largest commercial real estate services and investment firm (based on 2017 revenue). The company has more than 80,000 employees and serves real estate investors and occupiers through approximately 450 offices worldwide. In Canada, CBRE Limited employs 2,200 in 22 locations from coast to coast. HSBC Bank Place, located at 10250 101 St NW, is an 18-storey office tower in the heart of Edmonton’s Financial District. HSBC Bank Place offers a variety of amenities including a seven-storey parkade with 24/7 security and heated underground parking. It is connected to the Edmonton City Centre mall via the main and second-floor pedway. HSBC Bank Place’s central location provides tenants with excellent access to public transit all within a one-block radius.